FluffyKnitterDeb: J is for Jaxon, the Fearless Sock Avenger! Jaxon is my sweetness who became part of my life July 3, 1992. I had just lost my Tatiana who was a Tortie Persian - black and orange with big copper eyes. I was so sad to lose my "TeeDee" and could never replace her but I knew if I didn't get a new cat soon, I might never be able to. So I opened the Sun Sentinel and began my search. 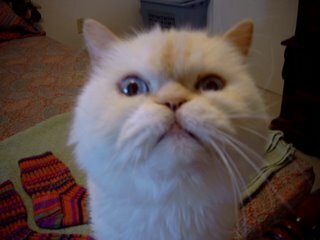 There were no light colored Persian males available but a few local breeders had male Flame Point Himalayans. A Flame Point Himmy has an almost white faintly apricot, fur with red "points" - ears, nose, paws and tail. And all Himmys have blue eyes. See? I had 3 local breeders lined up to see that weekend. It wasn't the best time to be cat shopping because it was the Fourth of July holiday weekend but these three agreed to see me. I visited the first two and altho the kittens were adorable, there was no spark between us. There were 5 adult cats, all who seemed content, and there were 10 kittens running everywhere. Only 2 of the 10 were Himmys, a female seal point and a flame point male, the rest were tuxedo Persians. All but the two Himmys were herded into another room while I was invited to get to know this brother and sister. I fell in love with the little flame point male so I sat on the floor to get to know him. Unfortunately, the feeling didn't seem mutual! Oh, he would come over, give me a sniff and stick around for a quick pat but then take off for more sibling play! In fact, his sister seemed more interested in becoming a part of the FK household than he was! But my heart was set on that "white" male. I expressed my concerns to the breeder, stating that he didn't seem to like me much! She kindly told me I could take him home for a week and if it wasn't a perfect match, I could bring him back! Now that seemed like a plan to me! And what did he do, this kitten who didn't seem to like me all that much? He climbed up onto my left shoulder and licked my face the whole way home! That was the day I met my familiar....Thruppence Furball Jaxon (his registered name). My Jaxon remained a "kisser" his whole life! He would meow until I leaned back so he could walk up my chest and plant his kitty kisses on my face! Ever since he was a small kitten he would sleep on my night table and every 2 hours or so, when HE needed a little attention, he would hop on the bed and start licking my face...believe me, it's is IMPOSSIBLE to sleep thru a sandpaper tongue bath! When I came back to knitting about 4 years ago, Jaxon was introduced to all things fiber for the first time and it became his mission to sleep on every piece of knitting that ever got washed at Chez FKD! No matter where I would put the garment to dry, Jaxon would find it! In my bathtub, Jaxon! Kitchen countertop, Jaxon! On top of my computer desk, Jaxon! He never slept in these places on other occasions but when wet wool was involved, his nose went into overdrive and he would find that yarn no matter how precarious the perch! My Jaxon had a special affinity for socks! I could hardly get him to budge to see if the socks were dry! He "defended" his socks so adamantly, I began calling him my Fearless Sock Avenger! 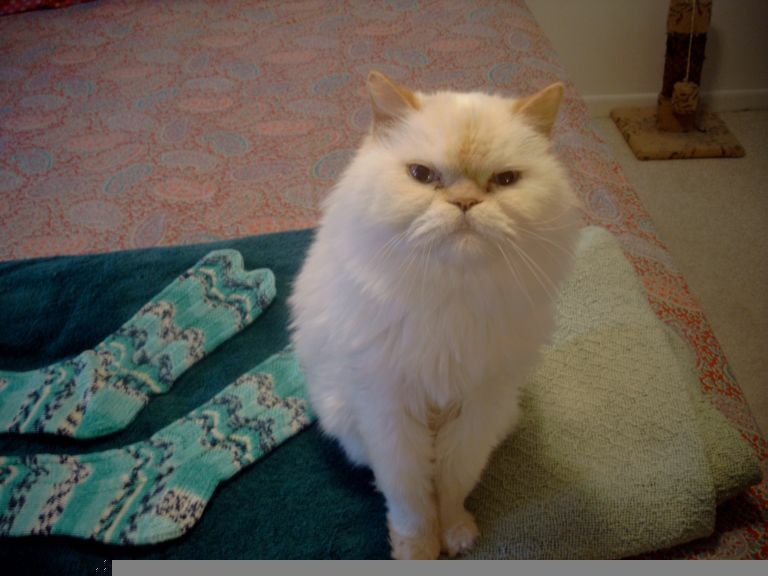 He especially loved to have his picture taken with his socks! 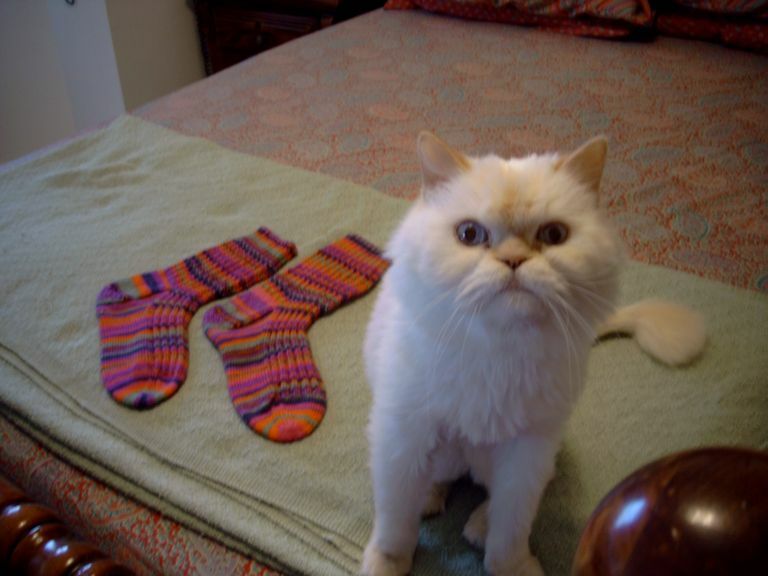 I lost my precious Sock Avenger, Jaxon a year ago last February and I miss him every single day like a physical ache. 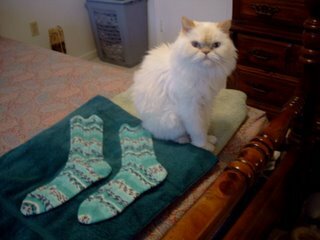 I know my Jaxon is avenging all the socks the angels knit in kitty heaven. Luckily a certain Florida Orange came into my life 11 days after I lost my hunnyboy and my P-Man helped bring my smile back to my heart and brings me joy every single day! I just wish Jaxon and Pumpkin could have met, they would have been such good friends. Sounds like quite a character! And a handsome kitty too. That's a wonderful, if sad, story. When I brought Mason home from the breeder he rode on my shoulder the whole way home. It was so sweet. 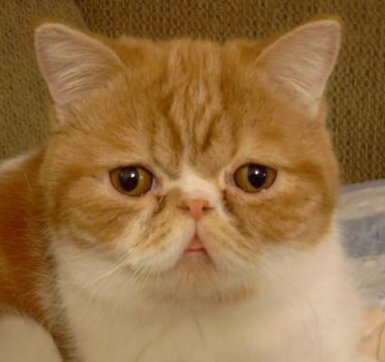 What a beautiful cat. It sounds like he was very special. I'm glad you introduced him to us. Friends, indeed! Sounds like they are kindred spirits. What a sweet "J". What is it about animals and knitted goodies? My Kirby does the same thing with anything knitted within reach. He wants to sit down on it or at least have some part of his body touching it! Must have something to do with the smell, although why Jaxon would have special affinity for socks is a mystery. This is such a lovely beautiful post on a lovely beautiful friend of yours! I too feel that Jaxon and Pumpking would be a pair of great friends. great post, deb. jaxon was a sweetie and p-man has filled some big shoes. as for the two of them meeting, i've often felt the same way about paul and my dad. i resolved it by realizing that they must have met, otherwise how would dad have sent paul my way? i'd say jaxon picked a wonderful friend to keep you company in his place. I thought no cat could be as handsome as p-man but J is really really cute? What a sweetie and obviously super intelligent to love SOCKS! It's true that even though we love our new fur babies, those special ones never leave our hearts and we miss them. What a wonderful tribute to a wonderful companion. Our furry family members certainly do carve themselves into our hearts and leave an ache after they are gone that will last forever. Jaxon certainly was a handsome little guy! We do miss our babies when they're gone. Having a new pet does ease the loss but you never forget or get over the one that came before. That was such a sweet story! I'm glad you shared it with us. Got me to smile for the first time in 3 days. I hope he's enjoying his poker games with Moze and Ed. "Sir Jaxon, Lord of the Strings"
What a sweet little guy, and the perfect "J". Thanks for showing him to us, Debi. What a gorgeous fur baby. Thanks for writing about him. Thanks for the story, Deb. The little furballs do tend to stick in our hearts and minds, don't they? But then again, I've often thought of them as furry angels with whiskers for wings. Hugs to you and P-man. Your kitties are so sweet! I'm sure Jaxon sent Pumpkin your way (but watch out for the Orange. I have one of those...). OH, Jaxon! What a cutie. Thanks for sharing, Debi! Awww he was beautiful. And obviously had good taste in knitting. He's truly a hunnybunny - it's so very sad to lose our baby-loves. P-Man doesn't fill his pawprints, but leaves his own on your heart! Very bittersweet story. I am so glad you have the P-man now. What a cutie! Pets are so magical and just worm their way into our hearts and souls. Hi from Austria! What a cutie Jaxon is, I loved reading through your story and finding out about his character - thanks for sharing! What a beautiful baby Jax was. Michael and I used to breed rare color-point Siamese and red-points were one of the colors we bred. We had an angel whose name was Machiavelli aka Moose who was a love also. He was one we kept because he had mega-colon poor lamb. Whenever his mom had a new litter she would go get the Moose monster and drag him into the littering bed and he would return to being her little boy. You should have seen an 18 pound "baby" nursing along with his newborn sibs. It was a real laugh. Time heals all even if it remind you of the healing.